You can’t blame a person for being passionate. Sure, but you have to love their passion. Yes, but that was the passion talking. Tell the passion to pipe down. Here’s the problem with letting passion rule one’s words: it eventually rules one’s actions as well, and at times with disastrous results. “From … passionate intensity emerges the totalitarian impulse. By their very nature, passions are deaf to reason and blind to limits or distinctions.” Elijah Mvundura. There is a better way. It does not deny passion but it does call for sober control of all you are. God has given you the mind of Christ. (1 Corinthians 2:16.) This includes being of sober judgment in addition to the ability to experience passions. Jesus sure did, and deeply. (Luke 22:44.) Your passions are a part of you, but don’t let them rule you or become an excuse for ill-advised words or actions. Exercise your mind to glorify God, whether with your passions or otherwise. This entry was posted in Uncategorized and tagged faith, Hope, Jesus, love, passion, totalitarianism. Bookmark the permalink. Well, that phrase “passionate intensity” got me thinking of Yeats’s “The Second Coming” which caused me to google the poem and read it, which somehow made me think about Donald Trump, and now I feel really (passionately) bummed. But seriously, these words are pretty sobering and a good warning. I didn’t mean to apply this to any particular modern person, Jeannie, since the portion of the article I took it from is a historical view of where this type of speech has led and it made me think of even more ancient cautions on speech from Peter’s first epistle. But on the Yeats poem, what do you think about writing a post on it and letting me run it here as a guest post? Actually I think I’d be a bit out of my depth with that one, Tim — it’s really just that I was so struck by how timely the words are. (To me it’s no stretch to see DT as a rough beast with a pitiless gaze, surrounded by indignant birds — whoa!!!) Right after the bit you quoted above, the writer says how “Primal passions: fear, egoism, anger, and hatred, the kind that Mussolini and Hitler exploited and mobilized, are once again potent factors in the politics of Western democracies.” The old adage about learning from history so that we’re not doomed to repeat it seems pretty apt too. That’s where I think the writer is focusing too narrowly. These are potent factors in politics across the globe. There is no region immune, and there are countries in some that have fully succumbed to them. 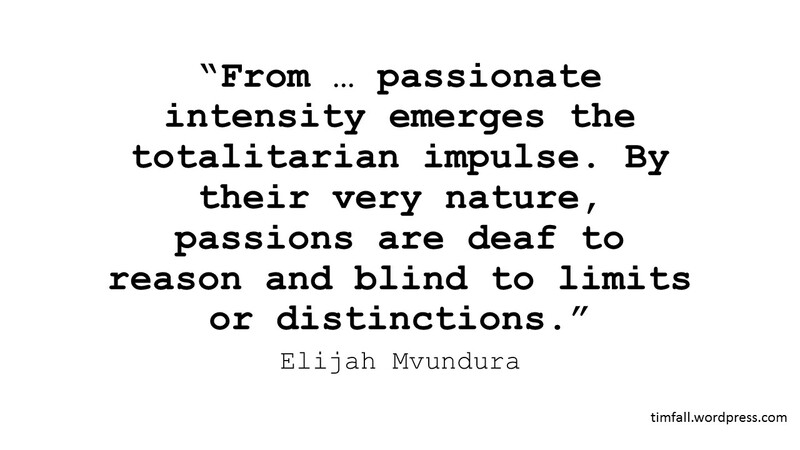 I think a lot of us need more passion. Perhaps the key isn’t how well thought through your passion is, the intensely passionate ‘worst’ keep telling very well thought through and logical their views are. They just have a blind spot in their ‘logic’ about how unjust and oppressive it is to those on the receiving end. I think passion for social justice and to end oppression is much safer than passion to punish whoever the scapegoats *cough*Mexicans*cough* *cough*Muslim refugees*cough* are. Of course we are in as much danger ourselves when our passions switch from the oppressed to those responsible for the oppression. That is when we need a more sober and dare I say compassionate judgement. Slouches towards the White House to be born? I don’t mean this to become a discussion of the present political landscape, since we can let our passions rule us wrongly in so many aspects of life that are not at all political. The issue I saw in the problems with passions is when they are the ones ruling us rather than the other way around. That can happen with me in so many ways. The PhD here is referring to the 5th song in the musical, “Turn It Off”. When I saw this off-Broadway, this song went to the point of my own denial of feelings due to programmed religious constraint. Granted I am in no way Mormon, however, this song had a message for me. Kunst goes on to explain in her article, that we need to manage feelings. As a Christian, I believe the Bible does actually teach us how to manage with maturity rather than deny with disdain or burst with boisterousness our feelings. However, we need to discern this from the Bible ourselves as the church or group think does not always get it right. Thank God for our feelings and our passion – we can own them. And thankfully the Holy Spirit guides us in using these for good and for God’s glory. Precisely. Our passions are not to be denied; they are to be Sprit-led. Part of the fruit of the spirit IS “self-control”.